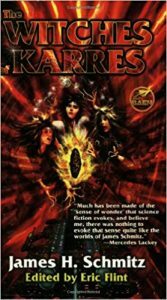 The Witches of Karres, a whimsical space opera by James H Schmitz, is an old favourite. I think I must have first read this in high school, but it still appeals. A young man, Captain Pausert, is on his way home from his first trading run, having made enough profit to begin paying off his heavily mortgaged spaceship. Pausert, while not overly bright, is honourable and kindhearted, and when he runs across a man abusing a teenage female slave, he intervenes. A few minutes later, so does the law, and soon he finds himself with a good deal less profit in his pocket and a troublesome girl in tow. Rescuing her two younger sisters eats up the rest of his profits. On their way home, the three girls use magic to give his ship a boost to outrun space pirates. When he delivers them to their home planet, Karres, the grateful inhabitants attempt to repay him by restocking his ship with their luxury goods. On leaving Karres with his cargo holds full of contraband, a young stowaway witch, and both legal authorities and pirates after his rumoured new drive mechanism, his troubles really begin. When he finally settles down to read the Space Regulations to find out what he’s gotten himself into, he doesn’t find the information he needs under either ‘W’ or ‘K’. The key word is PROHIBITED. An adventure follows, in which Pausert, out of necessity, develops his own newly-awakened magical talents, shows more intelligence than was obvious at the beginning, and saves the human race from an alien menace—a feat for which he is unlikely to receive any credit, except on Karres. This is lighthearted, undemanding entertainment, with no grounding in real science, and a plot that doesn’t hold up to hard scrutiny. Don’t expect to be intellectually challenged, just relax and enjoy the ride. This entry was posted in Space Opera. Bookmark the permalink.